The 2018 Toyota Avalon isn’t your average sedan. When properly equipped, the Avalon gets up to 268 horsepower and 248 lb-ft of torque. You can select hybrid powertrain options for improved fuel economy; the Avalon also with nine color options to improve selection. Plus, the Avalon has a bold front end, sweeping contours, and LED lighting to make the exterior bolder. In short, the Toyota Avalon is bound to stand out among competitors. The 2018 Toyota Avalon comes in eight trims: XLE, XLE Plus, XLE Premium, Touring, Limited, Hybrid XLE Plus, Hybrid XLE Premium, and Hybrid Limited. Don’t hesitate to get behind the wheel of the 2018 Toyota Avalon. A suite of safety features keeps you protected, including the Start Safety System extensive airbags, and standard Toyota Safety Sense™. The Avalon also has a powerful engine to make driving more thrilling; innovations like Entune™ audio make long trips more enjoyable. 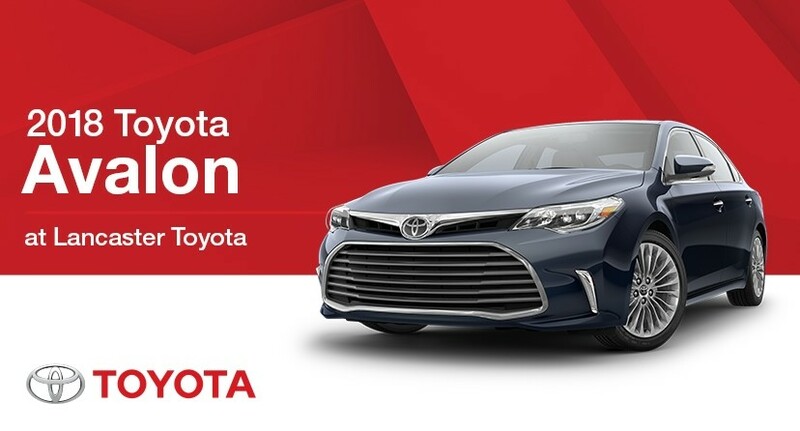 Check out the Toyota Avalon at Lancaster Toyota.